This is what we had for breakfast in honor of π day 03/14/15 at 9:26:53. I've never made key lime pie before, but wanted to experiment with combining an aquafaba meringue with fats. 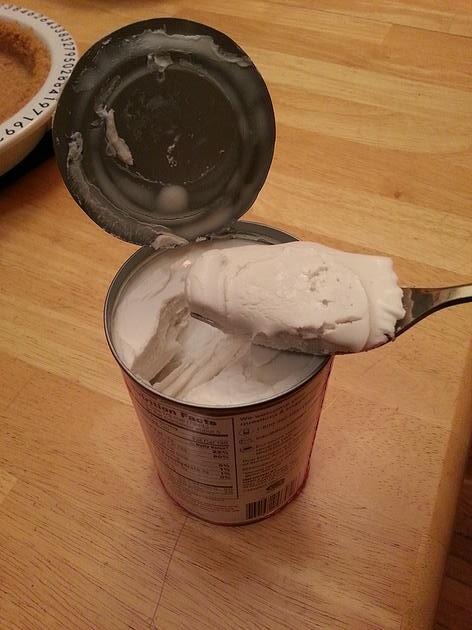 In this case, it was coconut cream from a can of full fat coconut milk. Traditional key lime pie is made from sweetened condensed milk, yolks, and lime juice in a graham cracker crust with whipped cream on top. Around where I live, key lime pies are actually green inside, but the traditional pies are light yellow from the egg yolk and condensed milk. 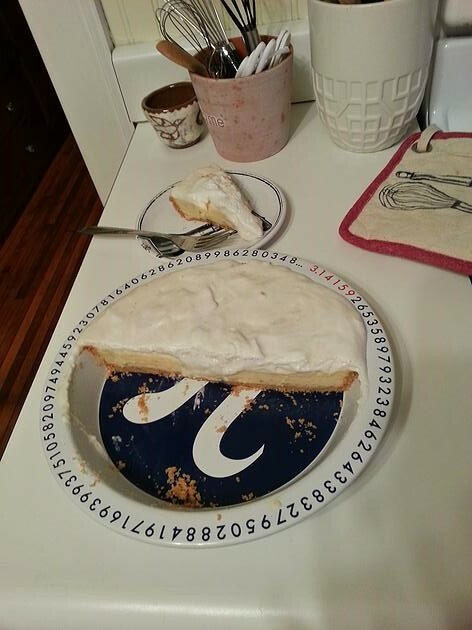 And it was one of the best pi·s I've ever tasted! 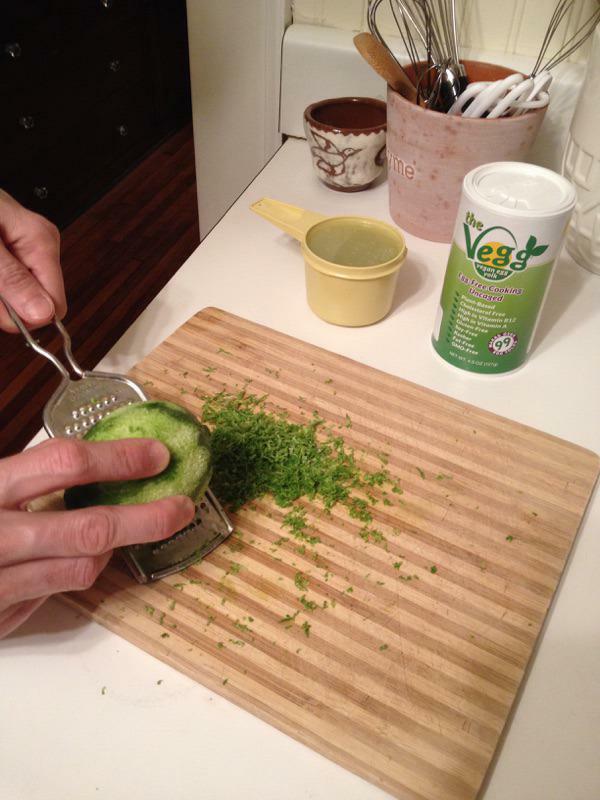 Most of the vegan key lime pie recipe ingredients I found are wildly different than the traditional version. Some recipes use soy, which I wanted to avoid. 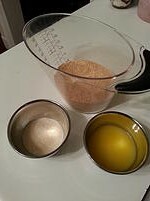 Some use cashews, which I like, but I couldn't find any recipes that had egg yolk in them. 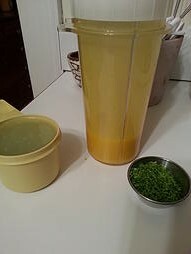 The Vegg is an amazing egg yolk substitute, so I thought I would wing it and see if I could make something somewhere close using simple, direct substitutes for the traditional ingredients. I mashed that as artfully as I could into the π plate, baked it for 3π [10ish] minutes, and set it aside to cool. 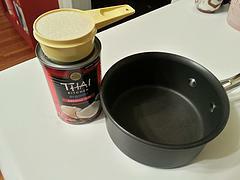 both cans of the sweetened condensed coconut milk from the previous step (it was still warm to the touch). Then I stared at that and ruminated for a really long time. 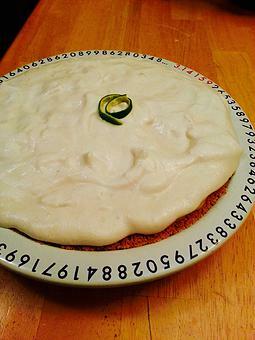 The idea with the real key lime pies seems to be that you bake that in the oven for 10 minutes at 350 and some magic happens between the yolks, the sugar, and the lime juice. 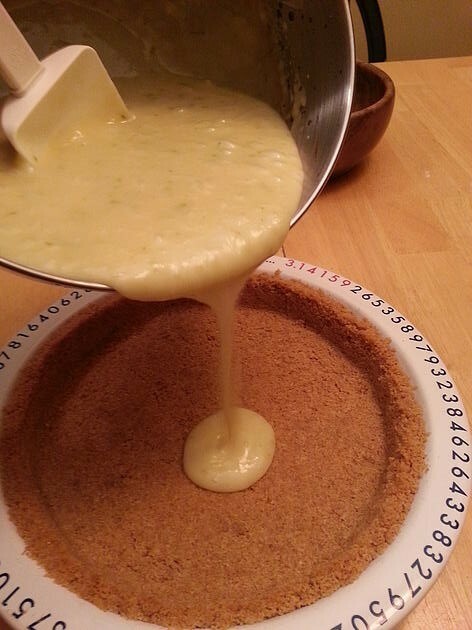 Trusting that magic, you're supposed to pour that into the shell, chill and be done with the pie. I don't have quite that much trust in The Vegg. It's wonderful stuff, but without a fundamental understanding of the chemistry going on there, my thought process was to stick the stainless steel mixing bowl in the oven at 360 degrees (because 2π radians and alll that .... it's a late night math joke ... anyway ...) for 3π [10ish] minutes and chill that to see what happens. I reasoned that if it firmed up like it's supposed to, I could probably just spoon it into the crust and nobody would be the wiser. and boiled those for five minutes and blended it into the cool mixture for about 3π [10-ish]seconds with an electric hand mixer on medium high speed and poured it into the shell. Setting that aside, I moved on to the topping. 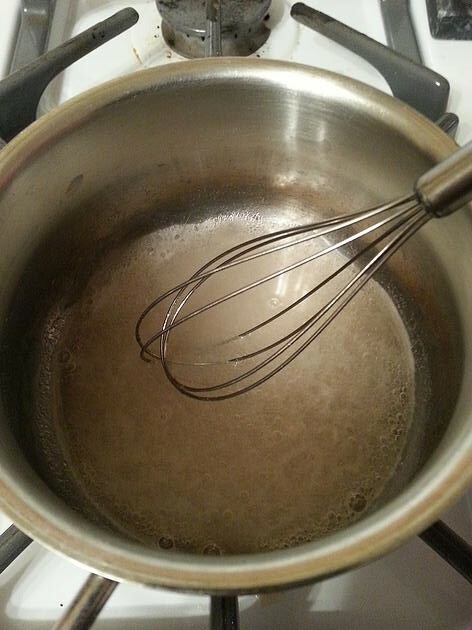 I whipped the liquid from a can of Libby's garbanzo beans in a stand mixer with balloon whisk along with a pinch of cream of tarter until stiff peaks formed (about 3.1415... mins). 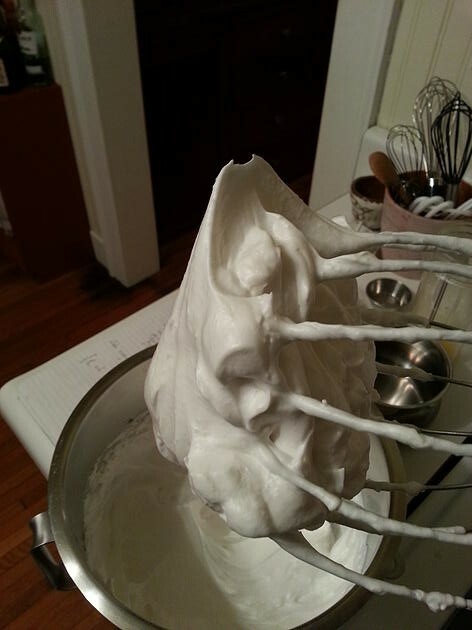 Then I slowly poured in the granulated sugar until all the sugar was in and the meringue was strong -- strong enough to stick straight up without falling while shaking the whisk. That strong. 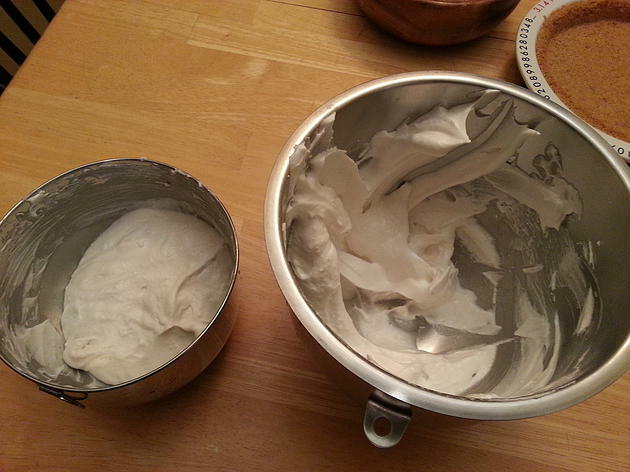 Half of the meringue went into one mixing bowl to test how well it would combine with the fat, and the remaining half I saved in case it failed. Gently folding the coconut cream into the meringue appeared to work at first, and tasted amazing. I am starting to develop a strong sensitivity to the taste of garbanzo beans, and normally would have used Great Northern or cannellini beans instead, but I have quite a few cans of garbanzos taking up space on the counter. The more I folded, however, the flatter and flatter the combination became. Figuring it was a lost cause anyway, I put the hand mixer on high and blended it completely flat. When it was done, it was just slightly thicker than the consistency of unwhipped cream. But it still tasted great! So, very delicately, I folded the flat cream into the meringue I had set aside, and put it onto the pie in dolops. As long as I didn't fold it too much, they seemed to stay in a delicious heterogeneous glob of glop on top of the pie. By then I needed sleep, so I put it in the fridge until morning. "This is the best pie, ever!" says our middle son. I don't know if that was the novelty of having pie for breakfast or not, but I had very nervously cut into the pie in the morning not knowing whether the amount of agar I had used was going to be anywhere near the mark. 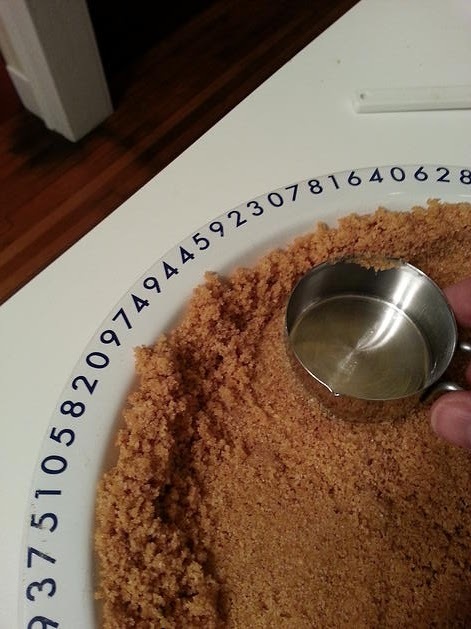 This is a pie I could definitely see myself making again, if only to translate the amounts into a non-pi-day version. I'm not sure if there's a better place in the process to add the agar, though, and I want to learn more about what that inside custard is actually supposed to be doing in only 3π minutes in the oven. There's some voodoo chemistry there. Full disclosure: I have never actually been to Florida, so I don't feel I'm actually qualified to judge just how good it was, since I don't believe I've ever had an authentic key lime pie. All I know is there's very little left of it, and I can't stop eating it!!! 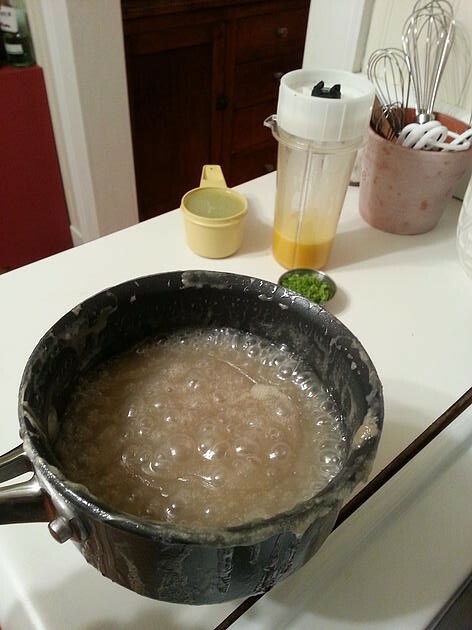 I also realized while writing this up that I forgot to put the vanilla bean powder into the middle stuff. THANK YOU !! For your recipe and wonderful experimentations!!!!!!! !